Menneskerettighetsaktivisten Sidi Mohammed Daddach er invitert til Norge for å fortelle om overgrepene i Vest-Sahara. Men marokkanske myndigheter har beslaglagt hans pass, og han er derfor ikke i stand til å forlate hjemlandet. Støttekomiteen for Vest-Sahara krever sammen med 30 andre norske organisasjoner at marokkanske myndigheter øyeblikkelig gir passet tilbake til Daddach og lar ham få fritt reise hvor han vil. Open letter to the Moroccan government. 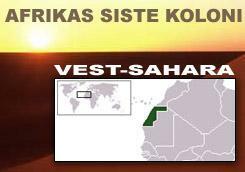 Appeal for the return of passport to Mr. Sidi Mohammed Daddach, Western Sahara. On Friday November 3 and Saturday November 4, the Norwegian Rafto Foundation celebrates the 20th anniversary of the Thorolf Rafto Memorial Award for Human Rights, and all previous award winners are invited to take part. The events are to take place in Bergen, Norway. (See www.rafto.no) There is one important person, however, who may not be able to participate. Sidi Mohammed Daddach won the Rafto award in 2002 for his struggle for human rights in Western Sahara, a country under Moroccan military occupation. Daddach is a leading advocate for human rights and a highly respected representative of the aspirations of the people of Western Sahara. When announcing the award to Daddach in 2002, the Rafto Foundation stated that “Daddach serves as a symbol for his people’s history of suffering and their fight for independence. Daddach is a moderate voice that can build bridges for the future. Despite having spent more than half his life as a prisoner of conscience, Daddach has never given up the fight for people’s basic rights and for human dignity.” He spent 24 years in Moroccan jails for his beliefs, of which 14 years on death row. He was not released from prison until 2001, after a global campaign for his release. Daddach received his first passport in November 2002, just in time for the Rafto award ceremony in Bergen, but only after intense pressure from the Norwegian government and civil society. On 27 March 2003, however, Daddach and a dozen other Sahrawi Human Rights activists were detained by Moroccan border police on their way to speak before the United Nations Commission for Human Rights in Geneva and their passports were confiscated. Since then Daddach has demanded to have his passport returned, so far without success. We are also aware that the Norwegian Ministry of Foreign Affairs has brought the issue of Daddach’s passport to your government’s attention on repeated occasions, but has to date not received a clear reply. Therefore, the undersigned organizations wish to appeal to the government of Morocco to return Daddach’s passport to him and allow him to travel to Norway to participate in the Rafto anniversary celebrations. We sincerely believe that failing to do so would further damage Morocco’s reputation internationally and detract from the image of a country intent on ending entrenched practices of authoritarianism and oppression of voices of dissent. Daddach’s voice is a moderate and responsible one, demanding respect for the basic rights of his people, but at the same time seeking to build bridges with Moroccan society. There is no legal reason that he should not be allowed to travel to Bergen this weekend, and we believe it is also in Morocco’s best interest to let him travel. You can make it happen by making sure that the passport is to be immediately returned to Daddach, and that no other formal or informal travel restrictions are to be imposed on him. We would also like to stress that it is our opinion that the passport never should have been confiscated in the first place. Sir, please be assured of our highest consideration and sincere greetings.